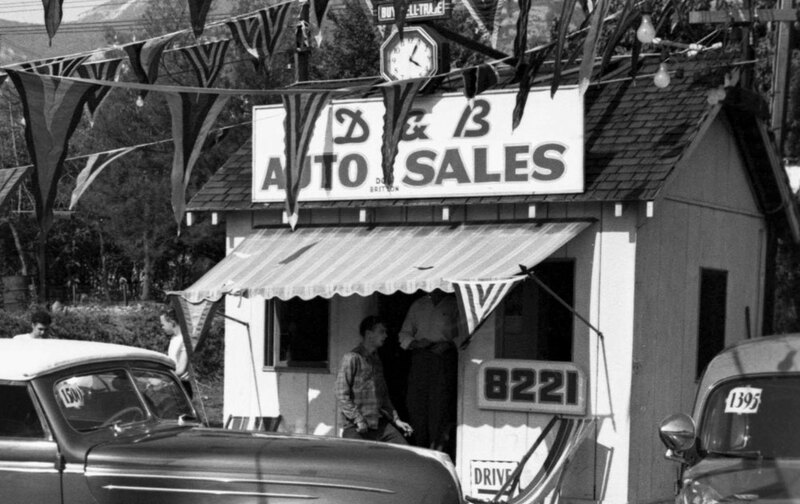 Stan Baker visited the D & B Auto Sales car lot in 1949. He brought his camera with him and shot some of the amazing cars that were for sale that day. 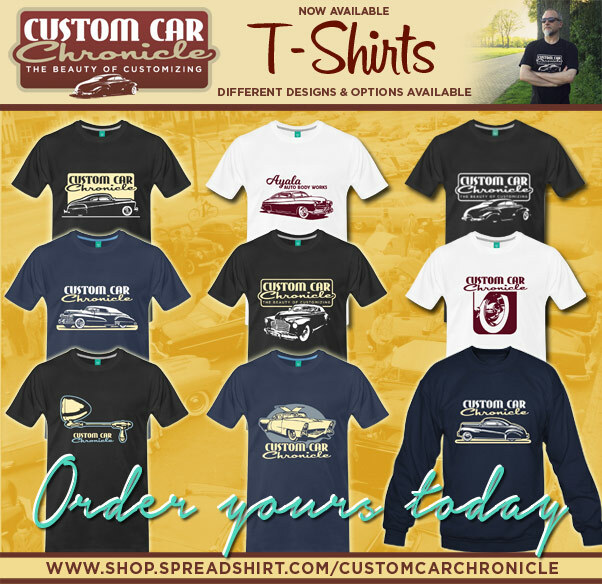 In the later part of the 1940’s and early part of the 1950’s there were several car dealers who were specializing in selling used Custom Cars and Hot Rods. One of those places was owned by Don Britton and located on 8221 Santa Monica Blvd. in Hollywood California. 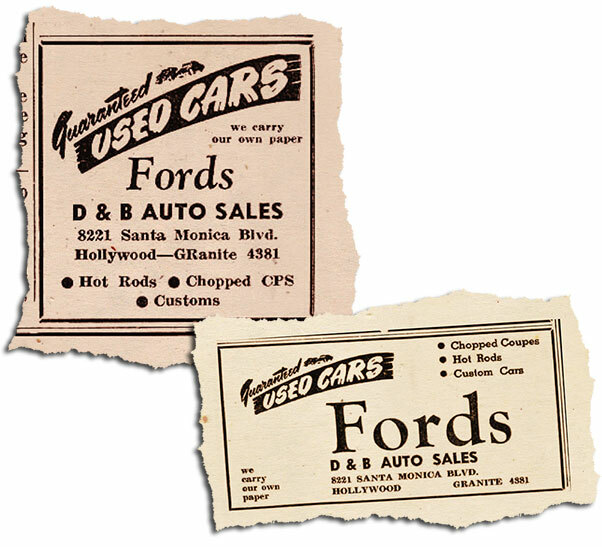 Don advertised his Auto Sales lot in the early years of Hot Rod Magazine, and also in the weekly Motor Sports World in the early 1950’s among other places. 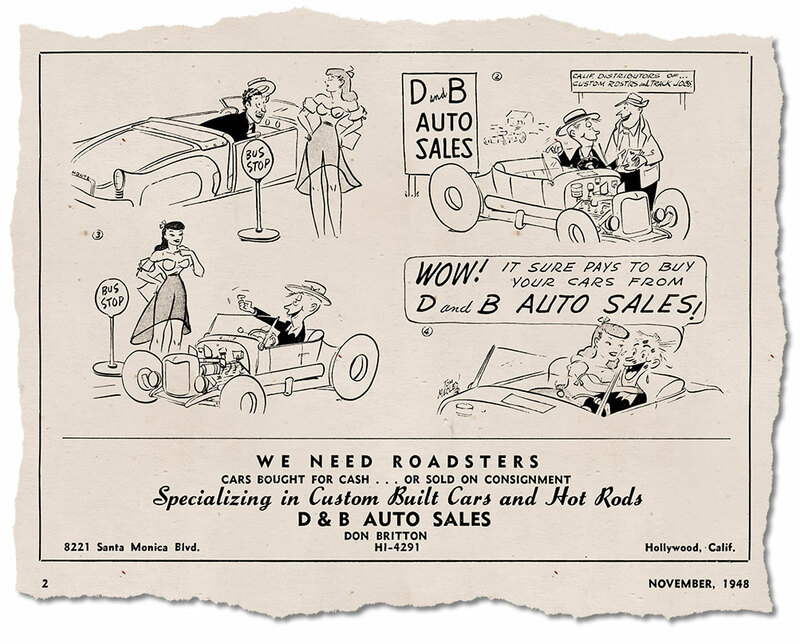 Don ran an large ad in the November 1948 issue of Hot Rod Magazine. 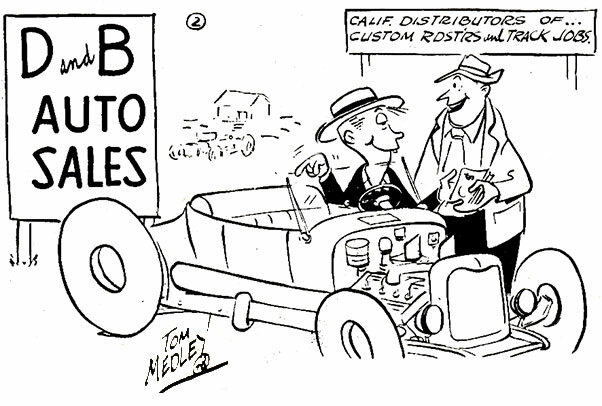 He had Tom Medley do a nice cartoon for it. The later ads were much smaller and only had text to advertise the Hot Rod and Custom Cars he had for sale. Most of the photos shown here come from the Mark Murray Collection. Mark inherited these amazing photos from his grandfather Stan Baker. 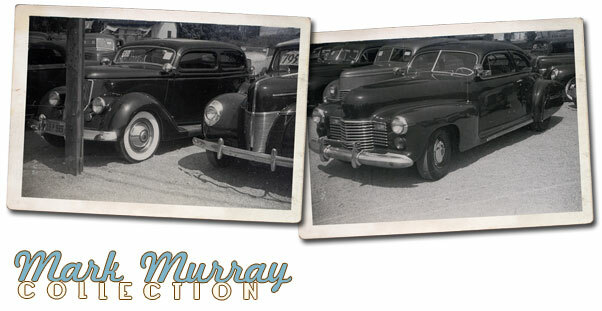 See more articles we did on the Mark Murray Collection here on the Custom Car Chronicle. This photo taken by Strother Mac Minn is included in the article because it shows the small wooden D & B office really well. We can also see in this photo that the whole lot was covered with colorful flags hanging from the telephone poles to the office building. 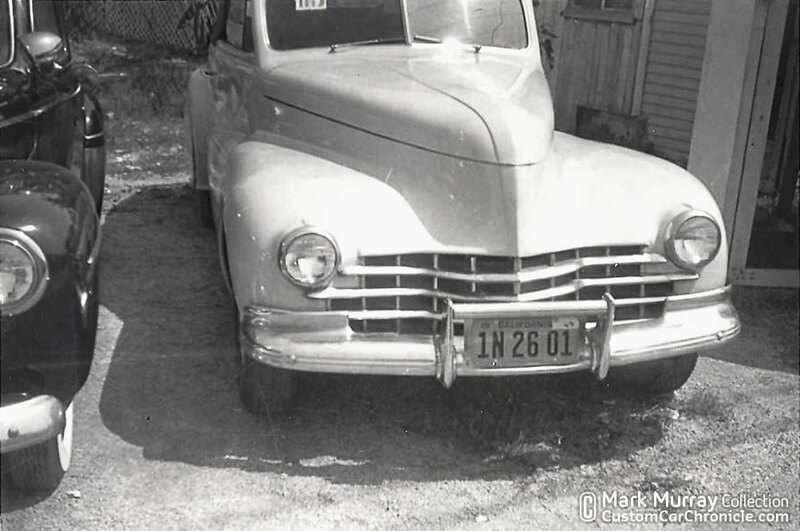 In 1949 Stan Baker visited the D & B Auto Sales lot and took a dozen or so photo of the car he thought were most interesting. And interesting they are. 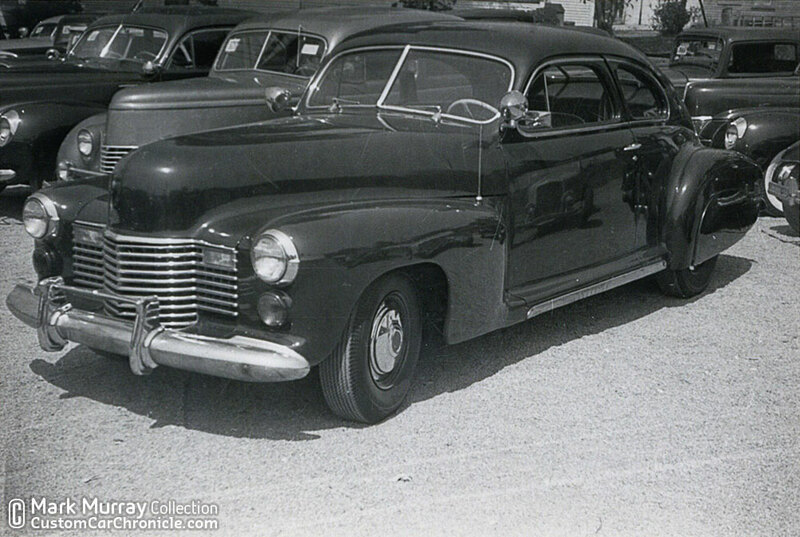 This was 1949, and the car at the lot were a bit older Custom Cars and Hot Rods at the time. We see some very creative cars in these photos. Perhaps not all as attractive as some of the more famous one we know from the magazines. But we have to remember that most of these cars were built before any major car magazine featured Custom Cars. Most of these cars were build by builders inventing the style back then. 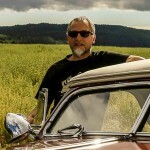 Stan Baker loved Custom Cars, as we sure can tell from these amazing photos. Chopped 1936 Ford 5-window coupe with blanked out rear windows. The side pieces of the grille were widened to make the actual grille much smaller, creating a much taller looking front end. 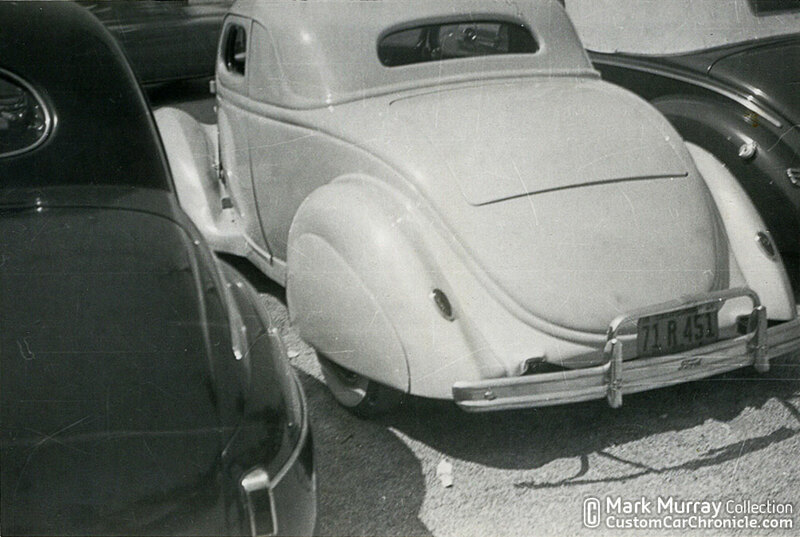 The fenders ere reshaped to fit a pair of 1940 Ford headlights placed just above the 1941 Ford bumper. The rear of the front fender was also reshaped after the running boards were removed. The painted wheels with small hubcaps give this car an real early 1940’s feel. When was it originally built? 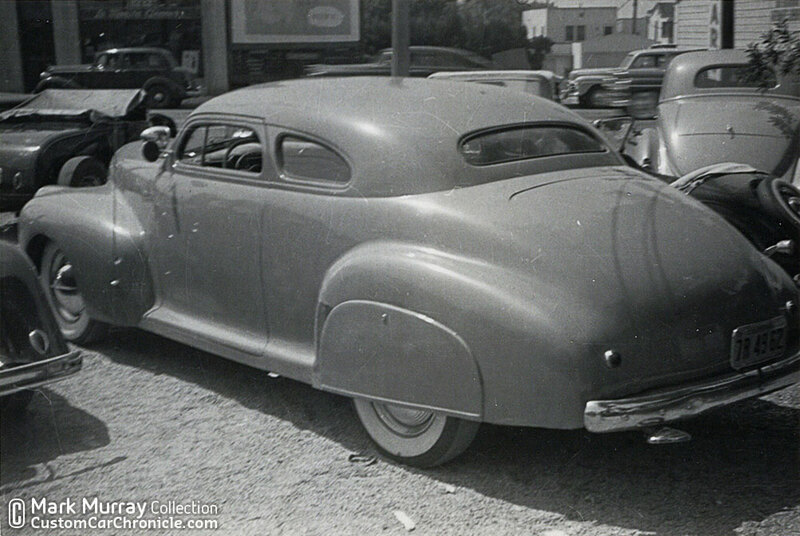 The rear of the 1936 Ford shows the reshaped front fender and the body extension to hide the frame after the running boards were removed. Interesting is that this extension is molded to the body, and not done as a separate piece as we normally see with this modification. Keeping the drip rail in place after the side window was filled in seems and odd choice. 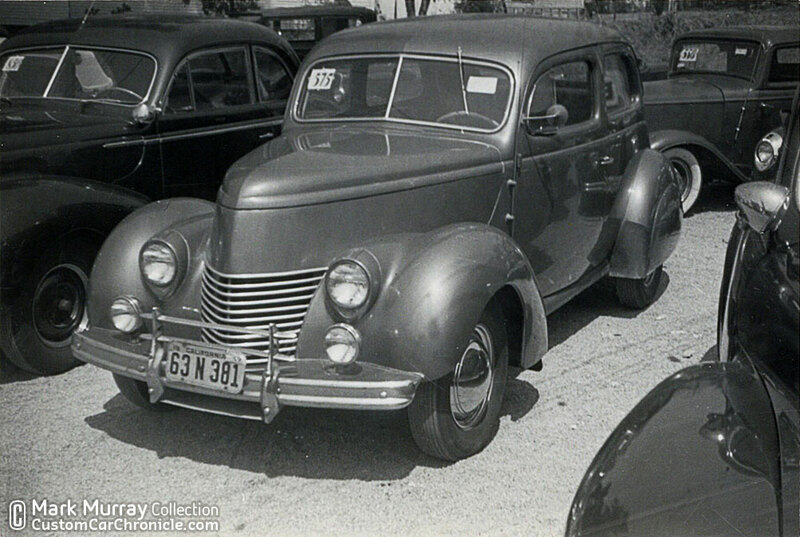 1938-39 Ford sedan with the running board removed and reshaped fenders. The hood sides were reshaped and welded into one single unit. The grille looks to be hand made from round tubing or stock. Early sealed beam headlights are painted body color and the 1941 Ford bumper sits on a custom molded in splash pan. The car sits rather high, like most of the early Custom Cars. Sitting next to is on the let is a near stock 1940 Mercury with small spotlights. (top and bottom) 1941 Chevy coupe full Custom with a rather heavy chop. The chop has a typical early style bulge shape at the back, and not the more pleasing flowing shape that came after the Matranga Mercury. All fenders were molded in, the taillights replaced with small round units. The grille opening was reshaped and the top section towards the hood removed and replaced with shaped metal to be part of the body. It looks like the grille bars are from the original grille and the surround was hand made or reshaped from other material. 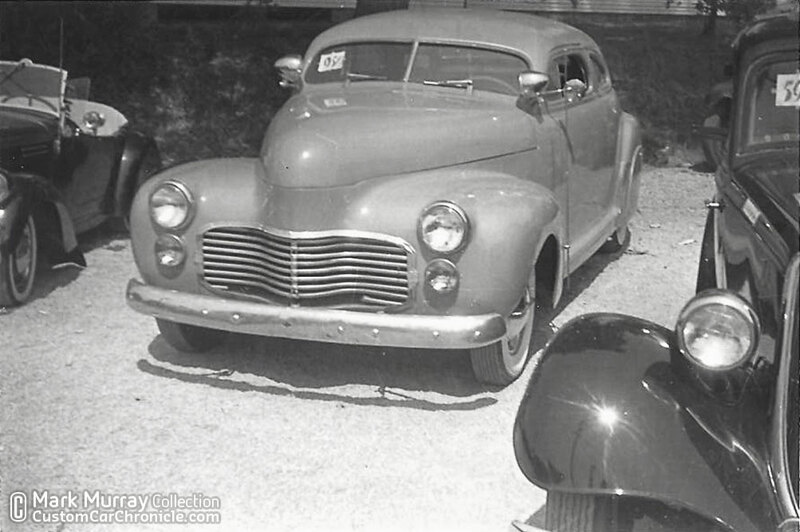 We already did an CCC-Article on this very nicely done 1936 Ford Sedan some time ago, but figured these two photos needed to be included in this article as well. (Top and bottom) 1941 Cadillac sixty-one mild Custom. Mostly stock, but with the hood emblems and ornaments removed for a much cleaner look. Appleton Spotlights and a new paint job. The top photo gives us a nice look at some other cars in the lot. This one is hard to identify. 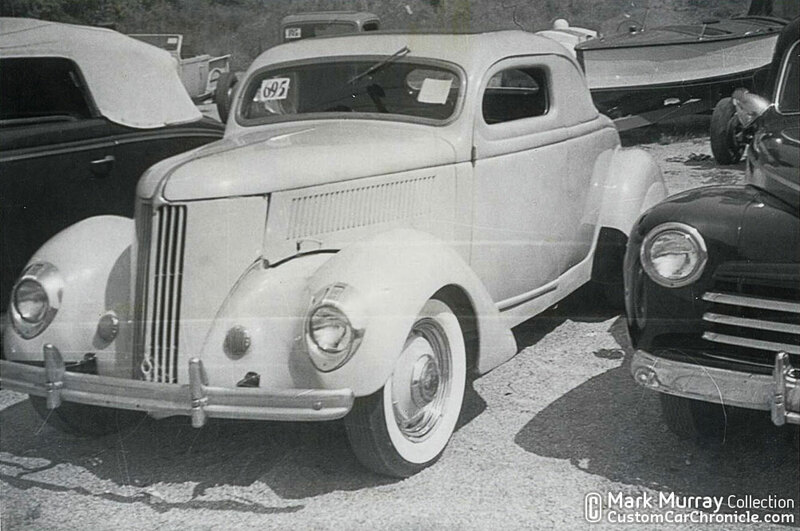 It looks like a 1939 or 1940 Buick could have been the base for this custom convertible. A cut down grille from a 1946-47 Cadillac was used. Combined with a 1941 Oldsmobile front bumper. 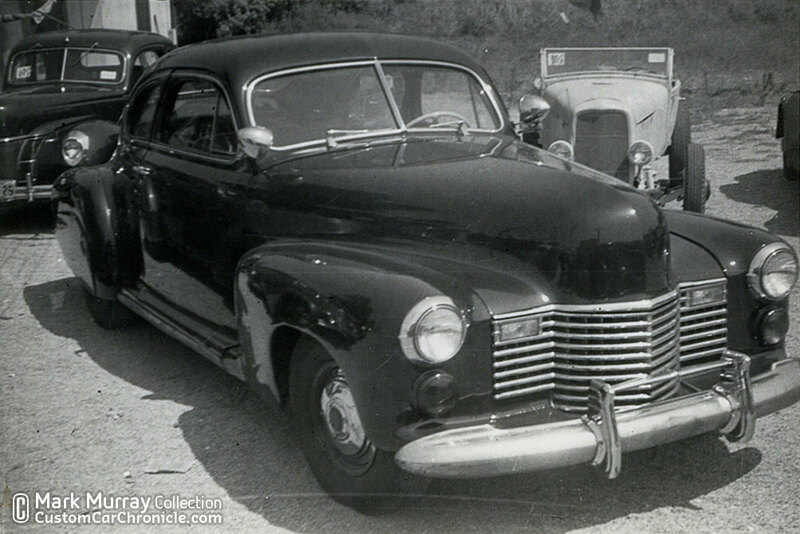 If this started out as a 1940 Buick then the headlights were repositioned., more outwards and lower thanstock. The interesting thing is that there seems to be a lot of work done on this car, but the windshield appears to be stock height. In the early 1950’s D&B owner Don Britten owned this Sam Foose sectioned 1950 Ford. 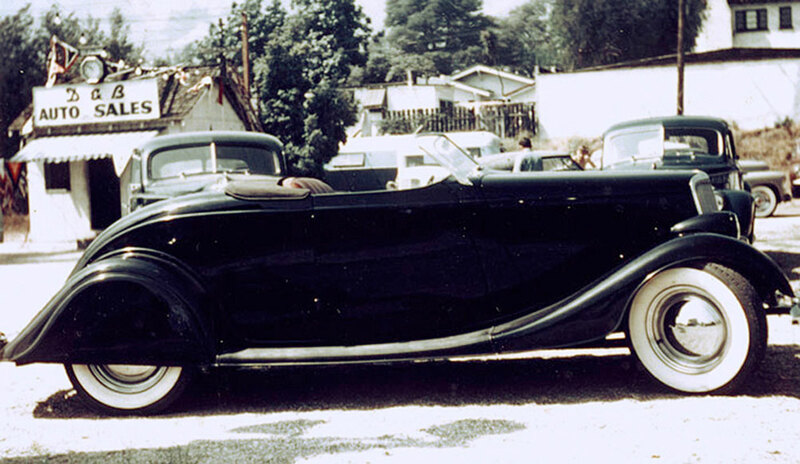 The car was featured in several early magazine, although Don was not always listed as the owner. So most likely he sold his own car on the D & B lot as well. Another photo taken by Strother MacMinn shows more of the colorful flags covering the lot. This interesting color photo from the late 1940’s comes from the Pat Ganahl Collection. 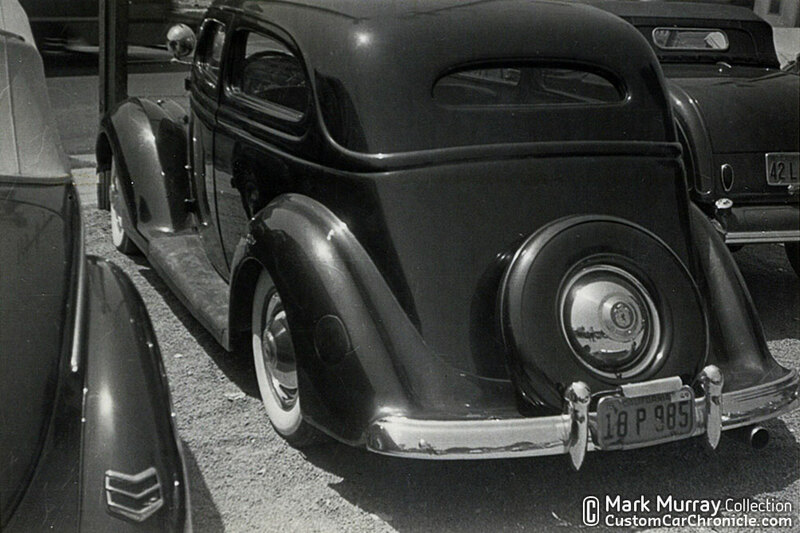 The Rodder’s Journal published his article on this car, the Wes Collin’s 1934 Ford in RJ issue 51. This and two more taken of the same car at the same time are the only color photos from the D & B Auto Sales lot I have ever seen. 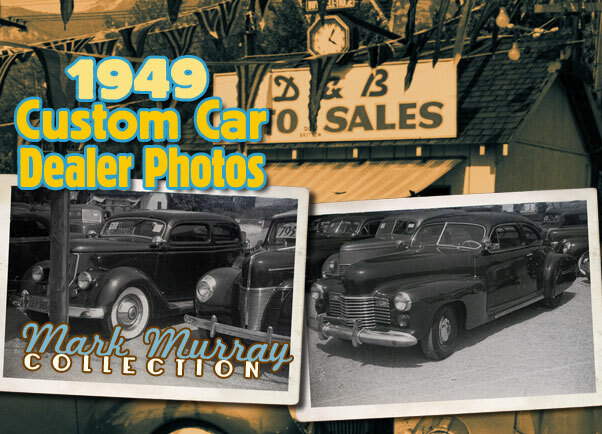 Great feature ,I have always loved reading about and seeing pics of these old dealerships. I wish someone would come forward with some new photos that we haven’t seen before. 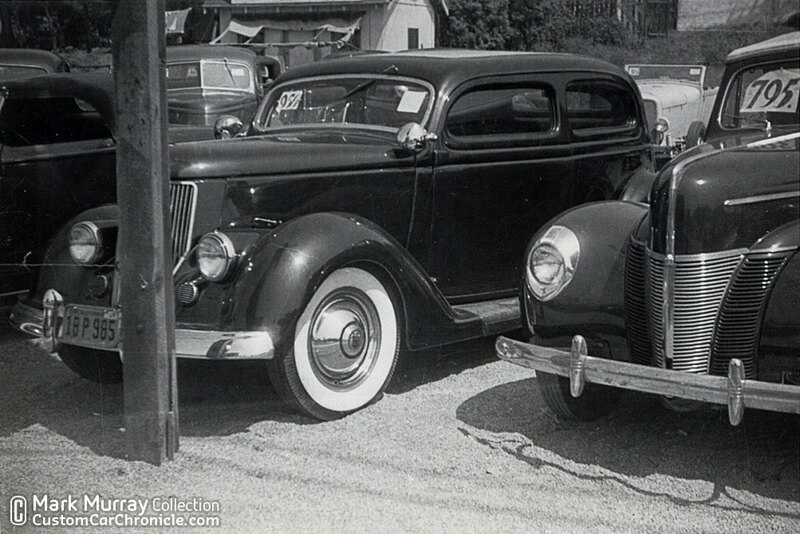 I especially like seeing the Chris Craft in the background of the white 36 ford pic. I wonder if there were more on the lot for sale. I would of had to get a job there since they had Customs and Chris – Crafts. Great article and pics Rik. I enjoy seeing customs in real world settings. Plus it shows just how many different types and ideas there were towards what makes a custom car. Also shows that for all the one’s that were featured in the mags there were many that weren’t. What a great article! Including the period ads gives it a great depth that it wouldn’t have otherwise. I love seeing these obscure cars. I would have loved to have been there to see them in person! 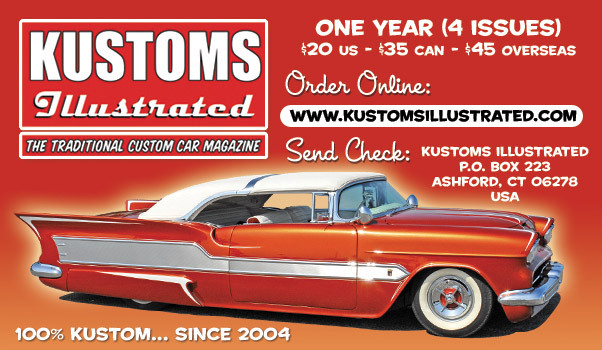 Loved this article, it’s a mind blower too see so many custom cars on a sales lot. The chopped ’36 Ford sedan is so cool.